Colorado's best-selling scenic wall calendar from Colorado's favorite nature photographer. Features large date boxes for busy schedules, thirteen new John Fielder photographs, worldwide holidays and moon phases. New photos of picturesque wildflowers and dramatic mountain landscapes. Extra large space for writing, and comes in a color carton for easy mailing. Experience Colorado's unparalleled beauty as seen through the lens of one of Colorado's pioneering families. Each month of this 12-month calendar features a large color photograph taken by Grant Collier, along with a smaller black & white image taken by Grant's great-great-grandfather, the pioneer photographer Joseph Collier. These images provide fascinating insight into the different perspectives of two photographers linked by family lineage but separated by a chasm of time. *A percentage of every sale is donated by Collier Publishing to non-profits working to protect the planet. 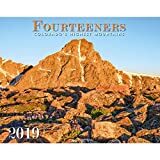 Features photos of Colorado's "fourteeners"
A beautiful deluxe wall calendar featuring photographs of Colorado's highest peaks by some of Colorado's best photographers! Spacious grid boxes for recording important dates and events! Spot gloss varnish on all photos to reduce ink transfer from one page to the next! Celebrate your love of Colorado's 14,000-foot peaks with this great calendar! Colorado offers some of the most thrilling vistas in all of America. With imposing mountains, lush forests, and mighty rivers, Colorado is abundant in natural beauty. It boasts more than 50 peaks with elevations of 14,000 feet or higher. Its star-filled night sky makes the impossible seem possible. 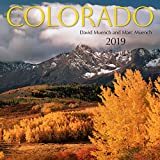 With breathtaking photos of Colorado’s canyons, mesas, and mountain ranges, this deluxe wall calendar celebrates the untamed beauty of the Centennial State. Colorado offers some of the most thrilling vistas in all of America. With imposing mountains, lush forests, and mighty rivers, Colorado is abundant in natural beauty. It boasts more than 50 peaks with elevations of 14,000 feet or higher. Its star-filled night sky makes the impossible seem possible. 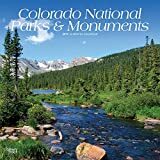 With breathtaking photos of Colorado’s canyons, mesas, and mountain ranges, this square wall calendar celebrates the untamed beauty of the Centennial State, and its national parks and monuments. Colorado's best-selling engagement calendar from Colorado's favorite nature photographer John Fielder. Features weekly formatted pages, fifty-seven new John Fielder photographs, worldwide holidays and moon phases. All new picturesque wildflowers and dramatic mountain landscapes. Comes in a color carton ready for mailing! From the Durango & Silverton to the Pikes Peak Cog Railway, the Colorado Narrow Gauge Railroads are the stuff of legend. 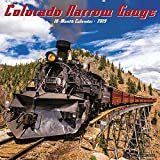 This calendar will take you back to the golden age when trains to cut through Colorado's mountain splendor on routes inaccessable by other forms of transit. This large format wall calendar features grids with ample room for jotting notes and begins with six bonus months of July through December of 2018. Also included are moon phases (CST), along with U.S. and international holidays. A beautiful, deluxe wall calendar featuring photography by award-winning Colorado photographer Todd Caudle! Spacious grid boxes for recording important dates and events! Spot gloss varnish on all photos to reduce ink transfer from one page to the next! 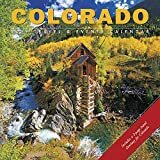 Not only does this unique calendar feature magnificent Colorado scenic landscapes, it's also a road-trippers dream providing suggested destinations, annual events and helpful websites enabling you to plan for future "Rocky Mountain high" outings. The large format wall calendar also includes four bonus months of July through December 2018; daily grids with ample room for jotting notes, appointments and reminders; moon phases; U.S. and international holidays.